Share the post "Rutgers-Led Alliance Awarded Statewide Award For Climate Change Preparedness"
Laura Tessieri, NJAFM’s Awards and Scholarship Chair, presents the “Outstanding Floodplain Management Award” to Marjorie Kaplan, of the Rutgers Climate Institute, who accepted the award on behalf of the New Jersey Climate Adaptation Alliance. 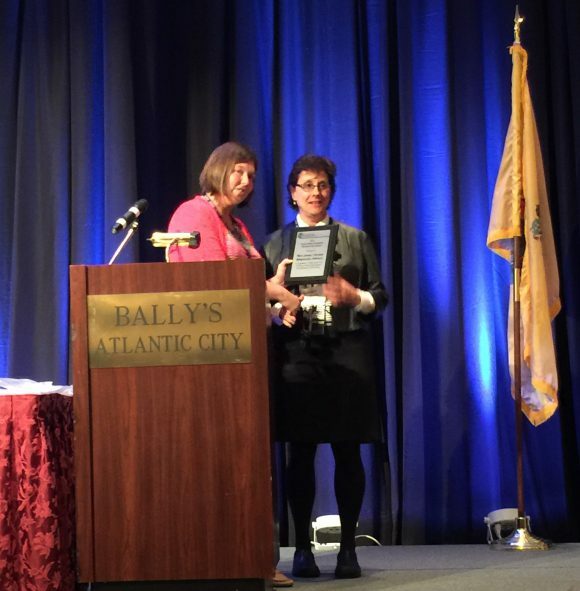 The Rutgers-led New Jersey Climate Adaptation Alliance (NJCAA) was awarded the 2016 Outstanding Floodplain Management Award for “progressive collaborative work on climate change preparedness in New Jersey” by the New Jersey Association for Floodplain Management at its 12th annual conference in Atlantic City in October. The Alliance is a network of policymakers, public and private sector practitioners, academics, and NGO and business leaders and is designed to build climate change preparedness capacity in New Jersey. It’s facilitated by Jeanne Herb of the Rutgers Edward J. Bloustein School of Planning and Public Policy and Marjorie Kaplan, associate director of the Rutgers Climate Institute. Former New Jersey Governors Tom Kean and Jim Florio are honorary co-chairs and its Advisory Committee is chaired by Michael Cantania, executive director, Duke Farms, and Kathleen Ellis, vice president and chief operating officer of New Jersey Natural Gas. The Alliance has issued over 30 reports and developed tools, videos and resources, and provided support in addressing climate change preparedness for New Jersey. To learn more, visit the Alliance website at http://njadapt.rutgers.edu/ and njadapt.org.